Carolina Express was formed by brothers Jonah and Grayson Riddle. Jonah is 17, and Grayson is 12. Growing up in the mountains of western North Carolina, Jonah has been playing the banjo for 4 and ½ years. From the first time he picked up the instrument, he fell in love. He started out playing at church three times a week. 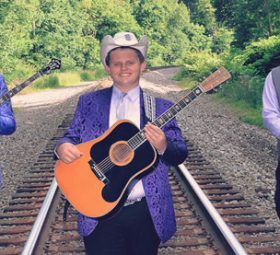 Because he enjoys bluegrass and gospel music so much, he decided to start his own band – Jonah Riddle & Carolina Express. Jonah’s brother, Grayson, plays guitar and does vocals. He has been playing guitar for almost 2 years. From the time he was only 5 years old, he would pick the guitar at church services. Jonah and Grayson credit the Lord for their playing and singing talent. Their dad, Benjie Riddle, plays the upright bass. 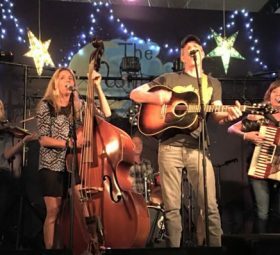 Jonah and Grayson have had the privilege of picking on stage with many great artists: Doyle Lawson, Darin & Brooke Aldridge, Balsam Range, Ralph Stanley II, Nu Blue, Ricky Skaggs, J.D. Crowe, and Kody Norris. They have performed at many concerts and venues across the country, including: The Ryman Auditorium Courtyard, Dollywood, the North Carolina State Fair in Raleigh, Woodsongs, the Lyric Theatre in Kentucky, Houstonfest, the Orchard at Altapass, the North Carolina State Bluegrass Festival, Bluegrass First Class in Asheville, North Carolina, the Earl Scruggs Center, the Pickin’ Porch, the Museum of Appalachia, the Carter Fold and the World-Renown WDVX Blue Plate Special in Knoxville, TN. Jonah and Grayson are also members of Tomorrow’s Bluegrass Stars and have performed at IBMA Kids on Bluegrass in Raleigh, North Carolina. They have won several awards during the time they have been performing such as Best of Show and individual awards for playing their instruments as well.